We are counting down the days to the ION GNSS 2010, the biggest satellite navigation technical event of the year, and this September, it’s on Inside GNSS‘s home turf in beautiful downtown Portland, Oregon— known as Stumptown, for reasons you’ll see as you fly over the forests of the Pacific Northwest. 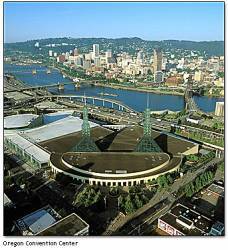 The Institute of Navigation’s 23rd GNSS show of shows opens at the Oregon Convention Center on Tuesday, September 21. The conference and industry exhibition runs through Friday, September 24. Before you arrive, orient yourself to Portland’s restaurant scene, coolest neighborhoods, and must-see attractions with Inside GNSS‘s Portland Fun & Frolic, a web guide to the city for the 20s and 30s crowd. (And those who would like to feel as if they were in their 20s and 30s). Find it at insidegnss.com/portlandfun. Once you get off the airplane, jump on MAX, Portland’s light rail system, to the conference center. Keep an eye out for the landmark Mt. Hood, Portland’s own live volcano. When you’re in the hall, you’ll find Inside GNSS at Booths 616-618, right in front of an Oregon mountain meadow, the Portland skyline and a GPS IIF satellite. Since we’re handling the ION GNSS Show Daily, and you’re reading this, your company or organization already has the inside track to coverage of your new products, company mergers and acquisitions, kudos and awards. It’s first come, first served, so send your news right away to editor Glen Gibbons. GNSS in Oregon? More Than You May Think!